With less than four months until the end of the 115th Congress, and with a record number of members departing the halls of the Capitol, the timing is right for a quick look at the outgoing crew. The 115th Congress, as sworn in on January 3, 2017, is the most diverse in race and gender in history, as well as one of the most highly educated. Women and minorities, however, are still far underrepresented in the nation's highest legislature. A new Congress begins at noon January 3rd of each odd-numbered year following a general election. A Congress lasts for two years (one election cycle), with each year constituting a separate session. non-white members is still only half the national number of 38% of the population. Including Delegates, there are an unprecedented 51 African Americans (48 House/3 Senate) and 46 Hispanic/Latino (41 House/5 Senate). 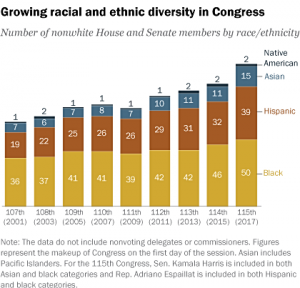 Members of Asian, South Asian or Pacific Islander ancestry number 18 (15 House/3 Senate) and two Native American Members serve in the House. The average age of House Members is 57.8, and the average Senator, 61.8. The share of women in Congress is at an all-time high at 112 or approximately 21%. In the House there are 89 (64 D/25 R), including five Delegates and one Commissioner, and 23 (17 D/6 R) in the Senate. There are seven openly LGBT members, including Senator Tammy Baldwin and Congresspersons Jared Polis, Sean Patrick Maloney, Mark Takano, David Cicilline, Mark Pocan and Kyrsten Sinema, who is bisexual. All are Democrats. In the US House of Representatives there are 238 Republicans (including one Delegate and one Commissioner), 197 Democrats (including four Delegates), and six vacant seats. The United States Senate has 51 Republicans, 47 Democrats and two Independents, who caucus with the Democrats. When it comes to religion, more than 90% of members are identified as Christian, with approximately 56% identified as Protestant and 31% Catholic. 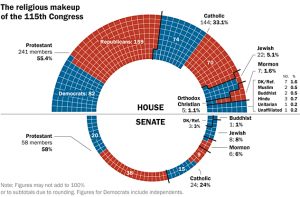 Congressional religious affiliation generally reflects the overall US population, although far more Americans identify as "unaffiliated" than do Congress members (23% v. 0.2%). The Average length of service at the beginning of the 115th was 9.4 years (4.7 terms) for a House Member, and 10.1 years (1.7 terms) for a Senate Member. A majority, 94%, of the members have a four-year degree and 65%+ hold higher educational degrees beyond a bachelor's. This far outpaces the roughly 33% of American adults age 25+ that have college degrees or more. The most common prefession for senators is law, followed by public service/politics, then business, while for the House it is the reverse order. In addition to those previously elected to other offices in the legislature, municipal or state government, a variety of professions have served as a springboard for the current office holders -- from physicians, dentists, veterinarians and ordained ministers, to a large contingent of educators, including coaches (85 in the House and 16 in the Senate). One area where representation has decreased considerably is military service. In the current Congress, approximately 19% of Members have served, compared to 1970, when approximately 70% of Congress had military experience. The percentage, nevertheless, is still higher than the average share of Americans who served, which stands at approximately 8%. Fortunately, the 116th promises to be even more diverse. Sources: Pew, Congressional Research Center, Congressional Quarterly, Brookings Institute. *Figures may vary due to the shifting demographics of current members, due to the high turnover of lawmakers via resignations and special elections.